Skiers, part 8 of 10—after the show closed. Al Kelley: Senior Director, Marine Mammal Operations. Andy Hansen: Wakeboard Camp [a water ski/wakeboard school he started]. Bill Schwartz: Property manager/real-estate investor and father. Bubby Snow: I run Bubby’s Water Shows. Taught water skiing. Carl Lipsit: I was in the Army for 26 years and retired as a Colonel in 2008. I now work for a firm as a Vice President with responsibilities for the international operations of the company as well as the contracting staff personnel. The company is heavily involved in biometrics, forensics, identity management, and advanced armoring systems (vehicle and personal), and we provide scientists and engineers working on a variety of issues. Christina Ashley: Real estate broker. Cindy Barhoff (Clasen): 4th grade teacher. Diane Smith: I am a retired teacher and Professor of English who taught all grades from elementary through college-level. Gary Thompson: Produce and operate ski shows and live action stunt shows. Greg Galloway: I own my own money management firm. Jacque Cook (Kuntarich): I had a brain aneurysm May 6, 2009. It was because of water skiing. I had to retire from my job; I was a make-up and hair artist [for everyone] from the president (I had secret service clearance at the White House) to hip hop artists. I was Johnny Cochran’s makeup artist, John Travolta, Gloria Estefan made me my first Mojito. I was always on a plane. I was home only 5-7 days a month. I’ve won a couple Emmys. I worked on the Witness Relocation Program. There was a women’s reunion after my aneurysm. When John Macqueen heard about the women reunion, he said I’m going to throw a party and say it’s my birthday but it was really just a chance to get together. You [might] think, [they’re] just ski bums, but everyone is very successful and many are multimillionaires. Janalee Zimmerman (Addleman): I graduated from college and got hired by the Somerset School District and I’ve been teaching there ever since. I’ve been teaching first grade for 29 years. Jody Spence: Manage a department at a timeshare company since 1994 in Florida, and then they transferred me to Vegas. Kaci Whittenton (Hedstrum): I am a petroleum landman, which is a independent contractor who in my case runs title for projects for oil and gas exploration. Kerry Lloyd: Teach hang gliding. I’m [also] a pilot. Linda Knapp (Moffett): I just retired from teaching. I taught second and fourth grades and most recently sixth-grade English. I told my students about skiing and being a professional athlete; however, they couldn’t really relate. Some of them were under the impression that they would go straight to the NBA after high school (with no desire to practice, of course). It’s hard for them to visualize a ski show since they pretty much don’t exist anymore and there aren’t any in Virginia. As far as the superheroes, it would be very difficult to explain that. A lot of adults have never seen a show. Lori Taylor: Mow grass and manage a rental property. Margie LaPoint (Bates): I teach kindergarten. 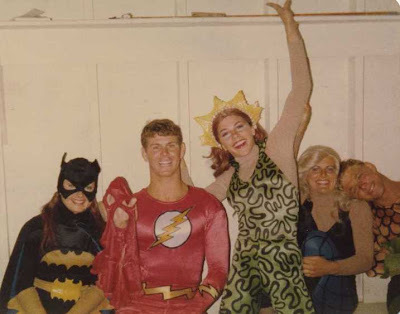 A great age to relive Batman, Spider-Man, etc., at Halloween! Mark Gutleben: Not much. Collecting social security and disability. Mary McMurtrie: Massage therapist and unit secretary for a hospital. Nancy Radant Combes: Special ed teacher. Paula Nelson (Bloemer): I am a substitute teacher. Roland Hillier: Own real estate rental properties and have taught science at Union Park Middle School since 1983. Sherry Wickstrom: Transportation Security Officer (TSA) Homeland Security. Shirley Duke: I am an Equal Rights Officer with FEMA. I am a Florida Supreme Court Certified Mediator and I was a volunteer mediator with the 9th Judicial Court in Orlando. I used a picture of me as Wonder Woman during one of our “Guess The Mediator” quizzes when they recognize several mediators at the end of the year. Steve Fontaine: I am an irrigation contractor. Suzanne Schwartz: I’ve worked in sales operations for a high-tech company based in Silicon Valley for the past ten years. I’m fortunate to be able to work from home. Sharkey recently left the large construction company he was working for (doing tool repair and general maintenance). Tom Weber: Work for a publishing company. Do you still water ski? Al Kelley: It’s been about 10 years. Bill Schwartz: Yes. 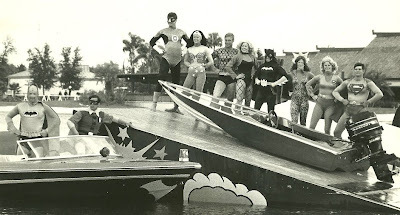 After Sea World I began competing in three-event water skiing (slalom, trick, and jumping). I went on to win many titles and championships in State, Regional, and National competitions. I won the 1997 nation overall title. I have not competed the last few years but do ski on a regular basis. I plan to compete [again]. Carl Lipsit: Whenever I get a chance! Normally, only when I get down to Florida and visit friends. Dave Madeline: In the last few years, I’ve been lucky to get out once per summer. Now I have a boat and I’m restoring it. I’ll use it to ski more, start teaching my grandkids, nephews, nieces. Doby Buesse: Yes, I wally around on the slalom and wakeboard. Janalee Zimmerman (Addleman): Yes. We still have a lot on Lake Stonycreek. I barefooted for my 50th birthday! Not very far though! LOL. Kaci Whittenton (Hedstrum): No. Busy busy busy. Kerry Lloyd: No, haven’t since 1997, at Holiday Park in Germany. I was the show director that year. It’s the hardest place in the world to water ski—way small, way tight, way dangerous. It’s only for the big dogs. So I did it once just to do it, and then I was done and haven’t skied since. 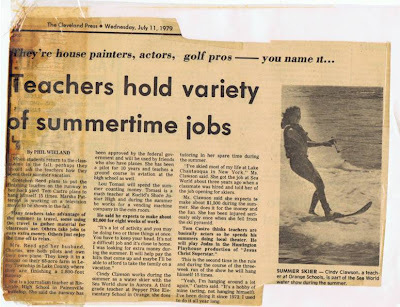 Margie LaPoint (Bates): I have nothing to do with water skiing anymore. I snow ski (Nordic) and ski race. I have raced my bicycle for many years since my water ski days, and now that I am older I run in races to complement my snow ski racing. I love living and playing and still think, feel, and look young. Randy Messer: Live on a lake and water ski occasionally. Can still perform most tricks. Several other former show skiers also live or have lived on the lake. It is our kids that use up the gas now. Shirley Duke: No, I retired from competitive water skiing in 1996. But I still have my skies, wetsuits, medals, and memories. Suzanne Schwartz: Up until two summers ago, our summers were still spent at the same lake that Sharkey grew up on. However, the Bureau of Reclamation chose not to renew the leases to the resorts on that lake and closed everything down. It’s too much of a hassle to get your boat launched (basically one ramp for the entire lake) so we’ve not been. We are probably going to sell the ski boat. If not, do you still have a presence on the water somehow (swimming, scuba, boating, fishing, etc.)? Christina Ashley: Yes, I am a water baby. I live on the water, sell waterfront properties, fish, swim, boat, scuba. Doby Buesse: Most definitely. Surfing, scuba, wind surfing, lying in the boat reading the Sunday paper or drinking a cold beer. Gary Thompson: Yes…we are very high profile on the water, always attracting attention. Jody Spence: No, not water. I have been a horse girl all my life, so I do a lot of riding. Linda Knapp (Moffett): We own 74 acres with an 11-acre lake on the property. We still enjoy water sports and have jet skis, a rope swing, canoes, etc. During the summer we are on the lake a lot. 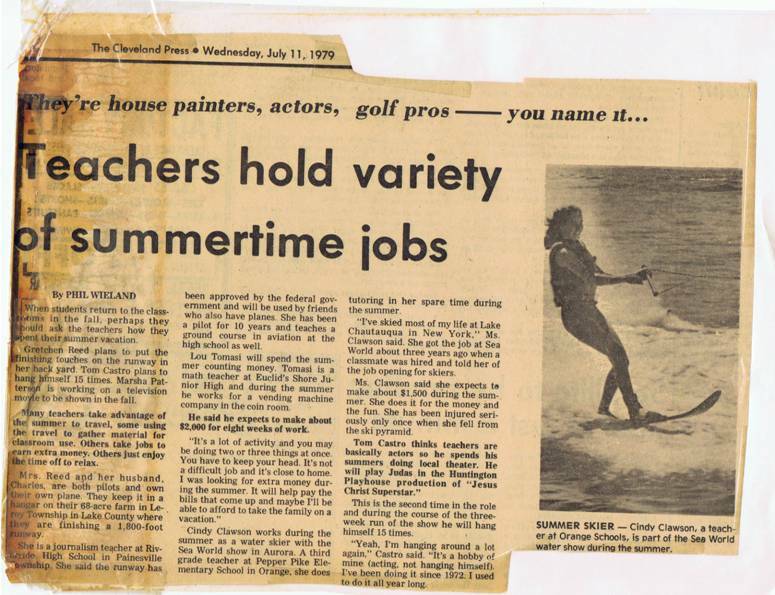 Randy Messer: Windsurfers were brand new back in late ‘70s. Windsurfing became my favorite activity for many years and I still get out regularly. I never wanted to leave show skiing and have worked out for the past 20 years building strength and maintaining fitness in the slim hope that one day I may perform again. I am 57 and am in better shape than when I skied in my twenties and thirties. Roland Hillier: Designated driver for my grandkids. Shirley Duke: My husband and I sold our Hydrodyne and took up kayaking. I love being on the water. We have two horses who also love to be in the lake. We’ve been married for 44 years. Water skiing was our first date. Steve Fontaine: I’m in the water every day at work. I also kayak. Do you have children and, if so, how old are they? Al Kelley: Three grown children, four grandchildren. Andy Hansen: 24, 22, and 19. Bill Peterson: Kyle is 35 and daughter Kaci is 30; she was named after a fellow skier, Kaci Hedstrum. Bubby Snow: Daughter 28, son 24. Carl Lipsit: One boy and one girl, ages 11 and 5. Christina Ashley: I have three boys, Charles 26, Christopher 22, and Wilson 20. Their last name is Nock. Cindy Barhoff (Clasen): 25, 23, and 20. Dave Madeline: One girl, schoolteacher, Emily, Maryland near Annapolis; one grandson. Diane Smith: I am blessed with two wonderful daughters. The older is 27, a graduate of UPenn Dental School, and currently at the University of Michigan completing her orthodontic residency. The younger is a graduate of Princeton University who is currently in her second year at Emory Law School. Gary Thompson: Two daughters and five grandchildren. Greg Galloway: Two boys, Clark, 18, and Drew, 17. Jacque Cook (Kuntarich): Son 21, daughter 18. Janalee Zimmerman (Addleman): We have four children. Katie is 25 and teaches at North Star Elementary School nearby. Sam, 20, is a sophomore at Duke. Lastly we have twin sons, Joe and Jordan, 18. Jeff Parnell: 2, 7, and 9. Jody Spence: 27 and 25. John Gillette: 15, 21, and 22. Kaci Whittenton (Hedstrum): Meegan, 26. Kerry Lloyd: Two wonderful children, 27 and twins. Boy and girl. Daughter married now for going on four years. I got three grandchildren. She doesn’t go to the hospital to have babies. Has them at home in the bathtub. Got it on video. She lives in Windemere, part of Orlando. My son has got his credentials for being a minister. He’s a manager of a Chick-fil-A and has been with them since high school. He’s a musician—way, way good. Plays with that group Between the Trees that were #3 on Billboard charts. He lives in Orlando. Linda Knapp (Moffett): One daughter, Katie, who is married and built a house on our property. She is 28 and is a chemist. Her husband is from the Czech Republic and is a police officer. Lori Taylor: 26 and 22. Margie LaPoint (Bates): I have two daughters, 23 and 24. Mark Gutleben: No, too bad. Never been married. Mary McMurtrie: Daughters 29, 28, and 23. Nancy Radant Combes: Two girls, 18 and 22. Paula Nelson (Bloemer): Two daughters. One is 24 and one is 20. Randy Messer: Daughter 18, son 16. Reyna Blasko: 27 and 28. Roland Hillier: Three your age [mid- to late-30s]. Six grandchildren. Sherry Wickstrom: A son, 26 years old. Shirley Duke: One daughter (27) and two sons (25 and 23). I have a granddaughter who is four years old (I’m a young grammy). Steve Fontaine: I have a daughter from my first marriage who is 21. Suzanne Schwartz: Son Ryan is 31 and daughter Afton is 27. Tom Weber: Five ranging from 30 to 16. Do your kids water ski? Al Kelley: Not yet but I plan on teaching them. Andy Hansen: World Champion wakeboarders, wakeskaters. Bill Peterson: They both water ski and snowboard. Both water skiied competitively, Kaci up to the National level. Kyle won the Junior World Championship overall and Junior Masters Overall; he was World Trick Ski Champ when he was 21. Now both just ski for fun—Kyle lives in Denver and snowboards mostly for fun. Carl Lipsit: Unfortunately no. They have not had the opportunity to learn. However, they do snow ski. Christina Ashley: They all do; not professionally. Gary Thompson: They all ski. It is required. My daughters were both Sea World skiers in San Diego. John Gillette: Dad’s requirement, like it or not! Linda Knapp (Moffett): Katie skied when she was two and was slaloming by 5. She skis occasionally. Mary McMurtrie: They all water ski, none with passion though. What do your kids think of your time as a water skiing superhero? Andy Hansen: LOL. They don’t ask much about it. I don’t talk about it with them. Bill Peterson: Kyle remembers it vaguely; they both hear the stories and think it was pretty cool. Bill Schwartz: My daughter just calls me a big kid. Carl Lipsit: They think it is funny. I think they would love to perform in the acts where you get to jump boats and jet skis off the ramps. Diane Smith: Of course they are proud that “old mom” was able to be a show skier at Sea World. It was their favorite theme park [when they were young] and when we would watch the ski show, I would narrate to them what was happening behind the scenes. I always watched in awe, hardly believing that I used to do all those stunts. Jacque Cook (Kuntarich): When they grew up, it was like a normal lifestyle for them. I was out of the house at 17. By the time I was 19 I was a world champion. I was also going to college full time. I was the only girl to do that. Some of the guys did. After the superheroes show, some of the girls did. Janalee Zimmerman (Addleman): They are impressed, however they also think it’s funny! You know teenagers! Moms are never cool! Kerry Lloyd: They don’t even know. They’ve seen pictures. They’ve seen me in entertainment for so many years it’s just another character. At Dixie Stampede in Tennessee, when my kids were ten, they did a special holiday show for six weeks built around them, my kids were so cute. My kids were in it—two little characters traveling across America in the 1800s on a wagon train. We home schooled. They traveled with me all over the country. Linda Knapp (Moffett): It’s hard to say since that was way before she was born and it was just a job. Mary McMurtrie: That we were awesome. Nancy Radant Combes: They think it was an awesome experience. One of them wears my old ski sweatshirt even at college. Paula Nelson (Bloemer): Since I was also an elephant-riding circus performer, they just think it was another peculiar occupation that I had B.C. (before children). My older daughter Jenna, an artist and vintage clothing re-designer, had a picture of me as Wonder Woman jumping a boat on display at her shop so I suppose she thinks it was pretty cool. The shop was called Sickboy Vintage in Tallahassee. 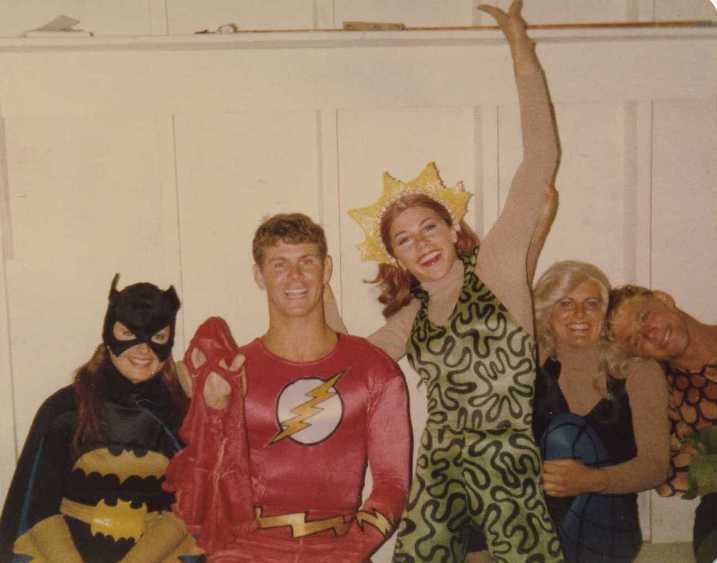 Randy Messer: Just recently found a tape of a superhero night show. Quality is marginal but watched it with son who thought it was kind of impressive. Sherry Wickstrom: He is more impressed with my skiing at Cypress Gardens. He saw an old-timers show I skied in. Have you been interviewed before about the SWSH show? Cindy Barhoff (Clasen): The Cleveland Plain Dealer did an article about interesting summer jobs. Reyna Blasko: I was Wonder Woman in an article for the armed services, I think. It has been so long. What did you first think when you learned why I was contacting you? Bill Peterson: Great idea. I like anything that promotes water skiing. Carl Lipsit: Thought [you were some] wacko dude until I confirmed with some friends that it was legit. Diane Smith: When I heard your message on the answering machine, I thought, “What a very nice and pleasant young man. What can it be that he wants?” I wanted to learn more about you, especially since you would be getting to know me. I read all that was online and ordered your book Boys of Steel: The Creators of Superman. Jacque Cook (Kuntarich): I have never been contacted like that before. I called Betsy. She said “I already scanned him. He’s legit. He’s got illustration.” A lot of us talked about you and they don’t understand it but I understand your passion. I told them I’m going to help you. Linda Knapp (Moffett): Wow—the memories flooded my brain. Margie LaPoint (Bates): I guess my reaction was one of surprise! Mark Gutleben: I was stunned and shocked. It was kind of exciting knowing that a story was being written up on what we did. Paula Nelson (Bloemer): How bizarre! Roland Hillier: Someone is planning to do a makeover show. Shirley Duke: It brought up all the wonderful memories again. I’m excited about your project and feel like a 30-year-old again, [though] I’ve never been much of a couch potato. Too bad we can’t all be in the same room together. Steve Fontaine: It put a smile on my face. Al Kelley: Unlikely but possibly. Andy Hansen: Sure, why not? That would give me more incentive to stay in shape! Grins. Bill Peterson: Depends on money, where, and when. Christina Ashley: Absolutely. How fun would that be. Dave Madeline: I can’t believe they would pay the way for someone to sign autographs. Sounds like a Star Wars get-together. I felt silly for signing them at Sea World. Remember, these people are water skiers and boat drivers. Let’s say yes for giggles. Greg Galloway: It would depend on where and how much. Jeff Parnell: Sure, why not. It would be another excuse to get together and party. Kerry Lloyd: Yeah, I probably would, for a day. Linda Knapp (Moffett): It would be fun to go to a convention; however, we just wore costumes and skied. Sure, I’d like to go. Nancy Radant Combes: Seriously? I doubt that would happen. Roland Hillier: I’d rather the fans keep the memory and have young stand-ins. Next: skiers, part 10 of 10—the memories. Posted 7:01 AM Labels Sea World, series: Super '70s and '80s, superheroes, where are they now?